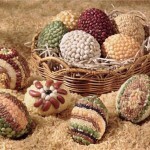 Easter is one of the most important christianity holidays. 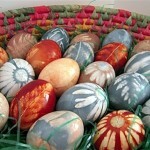 This day hundreds of millions people all over the world are coloring eggs. Today on our craft blog you will find very easy way to make an interesting Easter decoration – you don’t need any special materials and supplies to make these eggs. We need: eggs, food coloring, vinegar, white glue, a brush and tweezers. Step 1: Mix the food coloring, vinegar, and water. 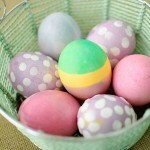 Paint the egg desired color and allow to dry. Step 2: Gently break eggs, peel them from the content, and allow to dry. 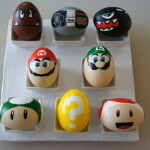 Step 3: Break colored shells into pieces. 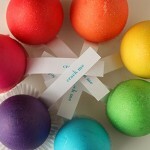 Use brush to glue our colored pieces and press’em to the main egg. Continue adding pieces, leaving a little space between them. Don’t worry about perfection, when you have a few pieces glued, your puzzle come together.